Wiscasset resident Sumner McKane shows his new documentary on Maine logging history, In the Blood, at 7:30 p.m. Friday, Feb. 3, at the Olin Concert Hall, 75 Russell St. The event is presented by L/A Arts and the Olin Arts Center. Tickets are $6 and available at www.batestickets.com. For more information, please contact 207-786-6135 or olinarts@bates.edu. 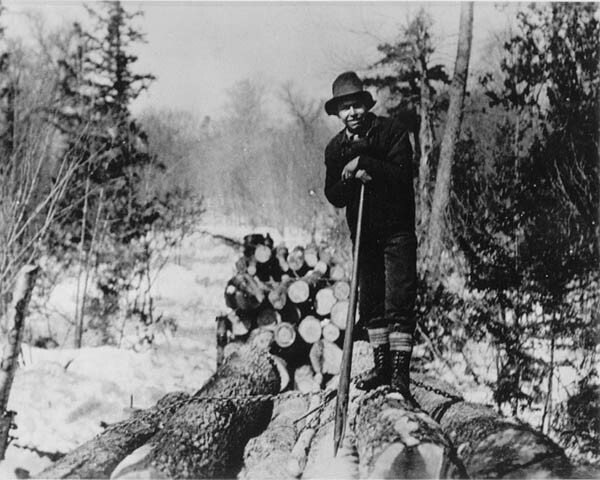 Maine lumbermen formed the backbone of an industry that helped make the state an economic powerhouse in the mid-to-late 19th century. They were innovators who found ways to extract countless tons of lumber through thick forests and down turbulent waterways to the sawmills and paper mills — relying on horses, oxen, primitive steam technology and, of course, sheer manpower. These workers symbolize Maine’s gritty and resilient reputation. As a child, McKane was fascinated by stories he heard in school about the rough and dangerous lives of Maine lumberjacks. For In the Blood, he compiled archival film and still photographs of the logging industry from the turn of the 20th century into a documentary both entertaining and educational. The film illustrates and investigates these individuals, their character and history, and takes viewers into their rugged world — the camps, the haul roads, landings and yards, rivers and lakes. The experience is a striking virtual journey into the 19th-century Maine woods. A singer-songwriter of folk-rock and Americana music, McKane also created the score for the film, which he’ll perform during the Bates screening with his bandmate Joshua Robbins.